No player in Pittsburgh Penguins history has inspired more passionate debate than Marc-Andre Fleury. While universally hailed as a wonderful person and teammate, Fleury's on-ice performance has been erratic. The same guy who won a Game Seven in Detroit to carve his name on the Stanley Cup has become known for catastrophic mishaps and maddening meltdowns. So it's no surprise Fleury's four-year, $23-million contract extension has sent hockey fans into apoplectic frenzy. Snarky stat kids ridiculed the signing, laughing at Pittsburgh's commitment to a "below-average goaltender." Rabid rivals celebrated, convinced Pittsburgh will never win another championship with Fleury in goal. Some more reasoned hockey minds wondered if a team like the Penguins, with two superstar centers accounting for $18.2 million against the cap, should invest $5.75 million in net. And some just wanted to blame Fleury because, well, that's what they always do. Before evaluating the Fleury extension, one must wade through the nauseating miasma disguised as hockey commentary. Critics spin the same tired narratives whenever Fleury gets mentioned. Let's examine the most scurrilous claims. 1. The Penguins won the 2009 Stanley Cup in spite of Fleury. Five years after the triumph, stat kids, who aren't big on actually watching games, see Fleury's .908 save percentage and assume he was average. Uh, no. Fleury was spectacular in making a string of series-changing saves against the likes of Jeff Carter, Alexander Ovechkin, and Eric Staal. He stoned Ovechkin on a breakaway in Game Seven, silencing the Washington crowd and denying the Capitals the all-important first goal. Fleury's Game Seven heroics in Detroit are well documented, and his save on Nicklas Lidstrom has become part of Stanley Cup lore. But most forget Fleury stood on his head in Game Six in Pittsburgh, stopping Dan Cleary on a clean breakaway in the waning moments. Geno Malkin, a passenger for parts of the opening two rounds, stole the Conn Smythe with a six-goal, nine-point explosion against the Hurricanes in the conference finals, which is when the national media starts paying attention. But Fleury was the true MVP; he was the difference each and every round. 2. Fleury is a below-average goaltender. Fleury has been significantly better than the league average in goals-against each season and has posted a higher save percentage in three of the four seasons, with the only exception being 2012 when he was one-thousandth of a point behind. Fleury's lone truly below-average season came in 2010 when his .905 save percentage was well below the .911 league average. But even that could be chalked up to exhaustion, because Fleury had authored two consecutive trips to the Stanley Cup Finals; the Penguins as a whole seemed sleepy in 2010. And Fleury's 2008 and 2009 seasons were both above average. At worst, one could say Fleury is slightly above average. But that painfully shallow assessment ignores context. Fleury is posting those "slightly above average" numbers playing behind a team that considers defense a character flaw. The Penguins aren't scared to give up ridiculous scoring chances. And please, spare me the absurdity of the NHL's charted scoring chances statistic. Such numbers are towering assumptions based on subjectivity, flawed data collection, and general tomfoolery. Watch the games. The Penguins make mind-numbingly stupid defensive decisions and commit murderous mistakes at the worst possible moment. It's who they are; it's what they do. Fleury gets hung out to dry more than a politician's integrity. Consider the defenses he's had in front of him. Who's the best defenseman to wear a Penguins sweater during Fleury's career? The list reads like a who's who of who canceled. Sergei Gonchar? He spent most of his time in Pittsburgh imitating a turnstile. Brooks Orpik? Rob Scuderi? Hal Gill? Try not to let the Norris Trophies blind you. Put Kris Letang on the Rangers, and Henrik Lundqvist would jump out a window. Fleury has never had a legitimate No. 1 defenseman. Ever. If his numbers are only "slightly above average," it's because the defenses in front of him have always been pedestrian, at best. 3. Fleury's backups routinely outplay him. Fleury's backups -- Jeff Zatkoff, Tomas Vokoun, Brent Johnson, and Brad Thiessen -- have played 84 games over the past four seasons, posting a 48-23-8 record with a 2.60 goals-against average and a .909 save percentage. Over those same four seasons, Fleury has gone 140-63-14 with a 2.36 goals-against average and a .916 save percentage. Fleury's backups are not outperforming him. Not even close. Regardless of the numbers, trying to piece together statistics from multiple goaltenders over several seasons to discredit a starting netminder is an illogical premise that should never be taken seriously, but it's particularly disingenuous in this case. Fleury plays 65 games a year. That isn't easy. There are about five guys on the planet who can do it year after year. His backups play once every two weeks or so, and it's usually against cherry-picked opponents. Roll out the best backup 60 times a year, and he will be exposed. Last season, Cam Talbot played 23 games for the New York Rangers and had a 1.64 goals-against and a .941 save percentage, both significantly better than Lundqvist's stats. Cam Talbot is not better than Henrik Lundqvist. I'm not sure why this rhetorical ploy gets used to besmirch Fleury. I'm guessing it's rooted in fond memories of Ty Conklin back in 2008 or perhaps Tomas Vokoun's strong effort during the 2013 postseason. Either way, it's a fallacious argument. 4. Fleury is the reason the Penguins haven't won another Stanley Cup. As mentioned earlier, the Penguins were exhausted in 2010. Yes, Fleury could have played better, but the goaltender most responsible for Pittsburgh's 2010 demise was Jaroslav Halak. In 2011, Crosby and Malkin were hurt. That team wasn't going to win anything with Dominik Hasek in net. Fleury posted an .899 save percentage for the series, but take away a disastrous Game Five in which he yielded four goals on 14 shots in 25 minutes, and he had a .916 save percentage in the other six contests. When Fleury got yanked in Game Five, Johnson stepped in and surrendered four goals on 11 shots, so there were plenty of problems in front of the goalies that night. The undermanned Penguins blew a 3-1 series lead and scored four goals the rest of the series, dropping Game Seven at home 1-0. Tough for a goaltender to win when his team doesn't score a goal. The first-round loss to the Philadelphia Flyers in 2012 remains the most humiliating defeat in team history. Fleury was, indeed, terrible. But he wasn't alone. This debacle was a team effort. Laughable defensive coverage, a complete lack of discipline, and no sense of accountability converged in one shameful cluster(sunshine). Dan Bylsma should have never coached another game in Pittsburgh. The franchise still hasn't recovered. And, yes, Fleury was brutal in 2013. He unraveled against the Islanders, and only Vokoun's presence enabled the team to reach the conference finals. However, Fleury had absolutely nothing to do with Pittsburgh's failure. Thanks to Vokoun, the goaltending was fine. Fleury's absence had no effect on the outcome. The Penguins lost because Crosby, Malkin, and the entire offense pulled a disappearing act against the Bruins, managing two goals in the four-game sweep. 5. Fleury is a mental and emotional wreck who can't handle playoff pressure. After the pitiful showings in 2012 and 2013, this was an entirely valid criticism. Fleury was broken. But it's never too late to mend. Following the loss to the Bruins, Fleury agreed to see a sports psychologist, something he had always resisted doing in previous seasons. The Penguins also hired Mike Bales, providing Fleury his first full-time goaltending coach. Let that sink in a moment. Fleury, who was drafted first overall and broke into the NHL as a 19-year-old, never had a full-time goaltending coach. Yeah, that makes a lot of sense. Best to just move on. The changes worked. A more mature, determined Fleury emerged from the ashes. In 2014, he put together another strong regular season and then carried the momentum into the playoffs. Even though the Penguins collapsed, yet again, it wasn't Fleury's fault. He answered all questions. The true test came in Game Four against Columbus. Fleury mishandled the puck behind the net in the closing seconds of regulation, leading to the tying goal. The Blue Jackets went on to win in overtime to even the series. Fleury, typically too nice for his own good, was downright surly in handling post-game questions. He certainly seemed like a different Fleury, but Pittsburgh fans had seen this fish before. The Black and Gold faithful prepared for the wilting Flower, publicly wondering who the starter would be in 2014-15. But Fleury responded like a champ, winning Games Five and Six to close the series and then posting back-to-back shutouts to stake the Penguins to a 3-1 series lead against the Rangers. That's when the offense dried up (noticing a theme? ), and the Penguins managed just three goals over the final three games. Of course, until Fleury and the Penguins raise the Cup again, critics will cling to the disproven notion Fleury can't handle playoff pressure. Those demons were exorcized in Columbus. They're solid gone. And for someone who supposedly has trouble with pressure, Fleury sure is good in shootouts, going 29-6 with a remarkable .805 save percentage over the past four seasons. He's the best one-on-one goaltender in hockey. 6. Fleury gives up soft goals and can't move the puck to save his life. Guilty as charged. Hey, no one's perfect. But think how exciting it is each time Fleury leaves the crease. Like a monkey on a high wire. 7. Fleury isn't worth $5.75 million per season. There was a time when I questioned whether the Penguins should be paying Fleury $5 million a year. And then I looked at goaltender salaries. That learned me but good. Still think Fleury is overpaid? Who on that list would you rather have than Fleury? The obvious names would be Lundqvist and Quick. 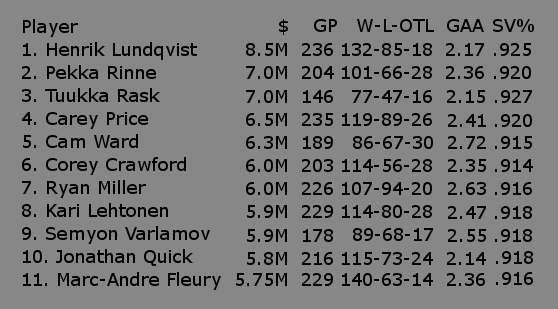 Lundqvist is three years older than Fleury and comes with that hefty $8.5-million cap hit. Quick can be shaky at times, but he's got two Stanley Cups for a reason. Either one could be seen as an upgrade, although how they'd fare behind Letang and crew is anyone's guess. Rinne is great, but he's got the bad hip and costs more money. Pass. Rask? Awesome stats, but he plays in a defensive system with Zdeno Chara and Patrice Bergeron, has never started more than 58 games in a season, and earns $7.0 million a year. I'll stick with Fleury for $5.75 million. Price has the Olympic Gold Medal and that impressive .920 save percentage, but he also benefits from a defense-first philosophy. In 2008, when Michel Therrien whipped the Penguins into a responsible defensive team, Fleury had a .921 save percentage in the regular season and a .933 mark in the playoffs. Coaching matters. Oh, and Price is 17-21 in the postseason. I'll take Fleury and pocket the $750,000, thank you very much. Lehtonen has overcome his injury woes to be a workhorse in Dallas, and he's the real deal, but he's never won anything and has exactly two playoff victories on his resume. Give me Fleury. Ryan Miller is five years older than Fleury and makes more money. No thanks. Lundqvist and Quick. That's it. If the Penguins don't re-sign Fleury, who replaces him? The top free agents this summer will be Antti Niemi, Viktor Fasth, Karri Ramo, and Josh Harding. Niemi is actually the best statistical comparison to Fleury. Over this recent four-year span, both netminders have 2.36 goals-against averages, and Niemi barely edges Fleury in save percentage .917 to .916. And, like Fleury, Niemi has a Stanley Cup. The big difference is Niemi earned those numbers with San Jose, a better defensive team than Pittsburgh, and he's also two years older than Fleury. Niemi counts $3.8 million against the cap this season, and unless he struggles, his salary will jump above $5 million. Why? Because that's the cost of doing business. Is it worth bailing on Fleury to try and save a couple hundred grand on Niemi, and then worrying about how he adjusts to life in Pittsburgh? Another option would have been to replace Fleury with two proven veterans and then work a rotation or ride the hot hand. This proposal usually cites Vokoun's strong play as evidence the scheme could work. Sounds great in theory, provided the Goalie Fairy leaves two Vokouns under Jim Rutherford's pillow. These mythical "proven veteran goaltenders" actually have to exist. And if they do, you have to pay them. The current goaltending market pays Halak $4.5 million, Jonas Hiller $4.5 million, and Steve Mason $4.1 million. Going for someone less than $3 million means a goaltending tandem with the likes of Ben Scrivens and James Reimer. Stanley Cup, here we come! And here's the dirty secret about Vokoun: he lasted less than a year! A serious health condition ended his Penguins career after just 31 appearances, including the playoffs. That just shows how difficult it is to find goaltenders who take the cage 60+ times a season. The Penguins have one. Why give him up? Because Fleury plays so much, the Penguins can spend $1 million or less on their backup goaltender. Going with two cheap goalies is a great way to save money until the Penguins are losing 5-4 every night. A goaltender good enough to handle 40 starts will cost closer to $3 or $4 million, meaning two of those fellas will likely eat up the $6.75 million spent on Fleury and his typical backup. And keep in mind, the 1972 Boston Bruins were the last team to win a Stanley Cup splitting games between goaltenders (Gerry Cheevers and Eddie Johnston). The only thing worse than managing one goalie's fragile psyche is managing two. More goalies, more problems. The Penguins know what they have in Fleury. The devil you know is worth two in the bush. Most goaltenders peak between the ages of 29 and 34, a time when experience, mental preparation, and technical skill surpass physical athleticism. If anything, Fleury has always been too athletic, too willing to rely on reflexes and quickness than proper positioning. The older he gets, the more he'll settle down in net. Great goaltending is efficient goaltending, and Fleury has already simplified his game under Bales's tutelage. That progression will continue. At 29, Fleury's best hockey is in front of him. Marc-Andre Fleury has earned every penny of his contract extension, and he's actually paid below his fair market value. His contract will become even more of a bargain as the salary cap continues to rise. By signing Fleury, Rutherford secured one of the game's few workhorses and stabilized the position for the next five years. Fleury no longer has to worry about his future or whether the new coaching staff and management have faith in him. They do.